It's no secret that a traditional Thanksgiving dinner isn't exactly a paragon of healthy eating. There are a lot of carbs and a lot of fat. It's the only meal of the year where I literally go through pounds of butter. While I'm not about to ditch all the traditional favorites--I believe that a rich Thanksgiving dinner can balance with normal healthy eating--that's not to say that a low-calorie side dish isn't welcome to the party. 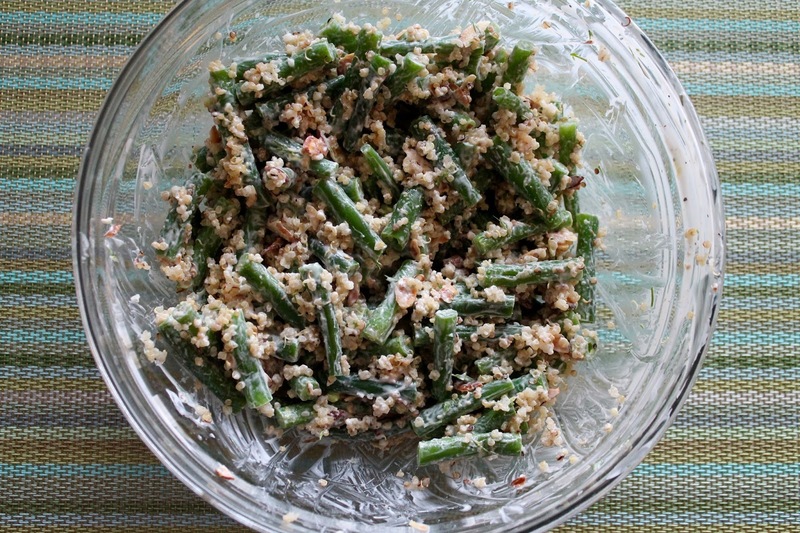 Enter this Green Bean and Quinoa salad, adapted from a recipe I found from the Wandering Spice blog. This is simple, vegetarian side that adds a nice bright and green element to the Thanksgiving table. Note: You'll only need 1/3 cup of pre-cooked quinoa. I usually make a cup, use 1/3 for this recipe and save the rest for salads, as a base for stews, or mixed into brothy soups. You'll also end up with extra yogurt dressing, which is the perfect match with raw veggies. 1. Prepare quinoa according to package instructions. Add 1/3 cup of the cooked quinoa to a large bowl; save the rest of the quinoa for other uses (see note above). 2. Place a steamer basket in a medium saucepan with 1 inch of water (make sure the bottom of the basket doesn't touch the water) and set over high heat to bring to a boil. Once the water boils, add the green beans and steam until they are tender, about 5 to 6 minutes. Remove the beans from the steamer and rinse with cold water until chilled. Transfer to the large bowl. 3. 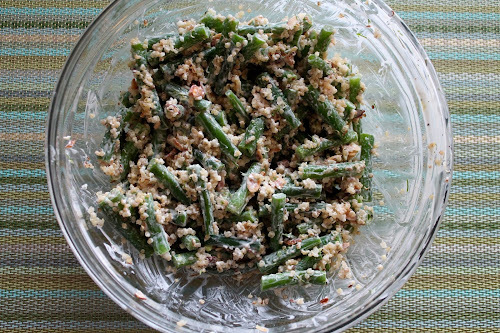 Toast the chopped almonds in a small frying pan over medium-low heat until they begin to brown, then remove from pan and add to the large bowl with the green beans and quinoa. 4. Combine the yogurt, lemon zest, lemon juice, olive oil, fresh dill, salt and pepper in a small bowl. Pour over the green beans and quinoa mixture and toss to combine. Serve immediately.